Millcreek Herbs LLC - Herb Articles - Healthcare: Post HRT Survival - Dedicated to the understanding, wise use and enjoyment of herbs. Merry's articles and herbs research will help you to learn more about medicinal herbs, culinary herbs and the wellness benefits of Complimentary Alternative Medicine (CAM). I took hormone replacement therapy for years to help relieve symptoms of menopause. Now I learn that it poses more serious health risks than benefits, so I stopped taking it. But the hotflashes, night sweats, and other symptoms have returned. Are there any herbs that can help me? The women I see who have been on HRT are having a tough time adjusting to being off it. In my practice as an herbalist, I used to have just one herbal formula to help relieve such symptoms; now I have three. It is my observation that it is a more complicated process to help women who have been on HRT than those that have not, because they are not only dealing with the normal menopausal symptoms but also the effects of long term HRT use and of ceasing it. Not being a doctor or scientist, I'd rather stay away from the explanation of what these effects are. What I understand is that the hormonal receptors on the cells are used to receiving their usual doses and have altered to accomodate them. The messaging system and liver, which process hormones, get gummed up, and the residue from long term use needs to be cleared from the body. That is why I recommend the nutritional tea below to support the body with assimilable minerals and nutrients that are good for the blood and that help the kidneys flush. Here are some suggestions and information about potentially helpful herbs. Black cohosh (Cimicifuga racemosa) is usually tops on the list of herbs to try. It is recommended for relieving hot flashes and menstrual discomfort and irregularities. New research shows that it is still unclear exactly how this herb has estrogen-like effects in the body without being estrogen, but that is often a characteristic of tried and true herbal remedies. We don't know why they work, but they do. There is no risk that I am aware of to taking this herb for up to six months in the recommended doses. Dong quai (Angelica sinensis) and chaste tree berries (Vitex agnus-castus) are frequently used to help with hormonal balancing. Dong quai is used to support the estrogen phase of a woman's cycle, and chaste tree berries are for the progesterone phase. Motherwort (Leonurus cardiaca) helps to reduce hormonally induced sensations of palpitations, anxiety, agitation and headaches. Do not take it if there are any indications of low thyroid function. Nutritional herbs such as oat straw (Avena sativa), nettle (Urtica sp.) and dandelion leaf (Taraxacum sp.) are essential to guarantee good nutrition to help the body function and eliminate properly. I recommend 2 cups of nutritional tea daily to help ensure a woman gets more than adequate nutrients and minerals that are easy to assimilate. Put a heaping teaspoon of equal parts of nettle leaf, dandelion leaf and oat straw in a cup and pour boiling water over it. Let it steep at least 15 minutes, strain out the herb and drink it. Oat straw is particularly valuable for its high calcium content, so one could choose to drink up to quart a day of it alone. Nettle is an effective diuretic, so though it is extremely nutritious, I do not recommend ingesting more than two cups of the tea of it daily. 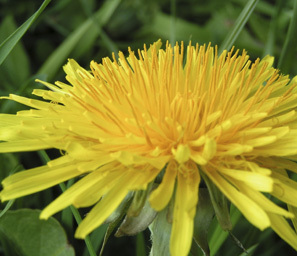 Dandelion is very high in minerals and is a non-potassium leaching diuretic. The herbs are usually available in the bulk herb sections of health food stores and the herb blend is also available at Millcreek Herbs. Menopausal symptoms can be much more numerous than just the ones mentioned here. Memory loss, weight gain, skin changes, depression, anxiety, insomnia, loss of sexual interest and reduced physical strength can also be part of a woman's experience. Fortunately, herbs can address these as well. One of the beauties of herbal medicine is that you can fit the right herb to the right person. Because every woman is different, there is not a one-size-fit-all herbal preparation but yes, there is hope for relief of menopausal symptoms using botanical remedies.